Today is the start of our AAU SPOTLIGHT. Each day we will spotlight a team or player right up to the live recruiting period. These will be players and teams, I feel are special in some way. Many are known by college coaches and some will be new faces. Today’s SPOTLIGHT PLAYER is a talented guard that we have been talking about for years. The 2020 Shore Shoreshots PAIGE SLAVEN. Paige Slaven it seems has been around forever. She started out basically as a unknown freshman when she entered Donavan Catholic High School. But that has all changed over the years. When Paige Slaven was named to The Hoop Group All Freshman team. It came as a surprise to many. In fact her rise was so quickly it caught me off guard as well. These days Paige Slaven is one of the best point guards in the Shore Conference. There are few if any guards who find Shooters the way the Miss Slaven does. She turns ordinary players into stars. In her 3 years she has helped 3 players become 1000 point scorers. Her ability to finish at the rim is right up with any guard in the state. She has improved her shooting each year and their is no question this AAU season that will be the biggest surprise to those watching her play. In the past she was surround by three point shooters. So their was little need to display these talents. Last season she averaged 11.0 points, 5 assists and 4.9 rebounds. She had 131 rebounds and over 50 steals on the season But it’s her ability to guard elite guards is what I like most. Slaven is a player that I believe will be even more effective at the D1 level after high school. Her work ethic and ability to raise not only her game but teammates as well is a gift. Paige Slaven has spent her entire career playing against the best of the best competition. It’s very hard to name a top guard in the state that Paige Slaven has not done battle against. More importantly she has made a reputation of playing her best in games against the best competition. Her toughness and competitive nature are off the charts. It really is what makes her special. In just about every big game Donavan Catholic played in, Paige Slaven seemed to play her best. Two years ago she singled handled tired to beat Manchester. This year with a young inexperienced team, she had 10 points, 10 rebounds and 4 assists vs. Manchester. Then against Jackson Memorial she had 18 points 7 rebounds and 6 assists. In her 2nd game against Manchester 14 points and 4 assist. Against Top 20 Marlboro she had 13 points and 4 dimes. 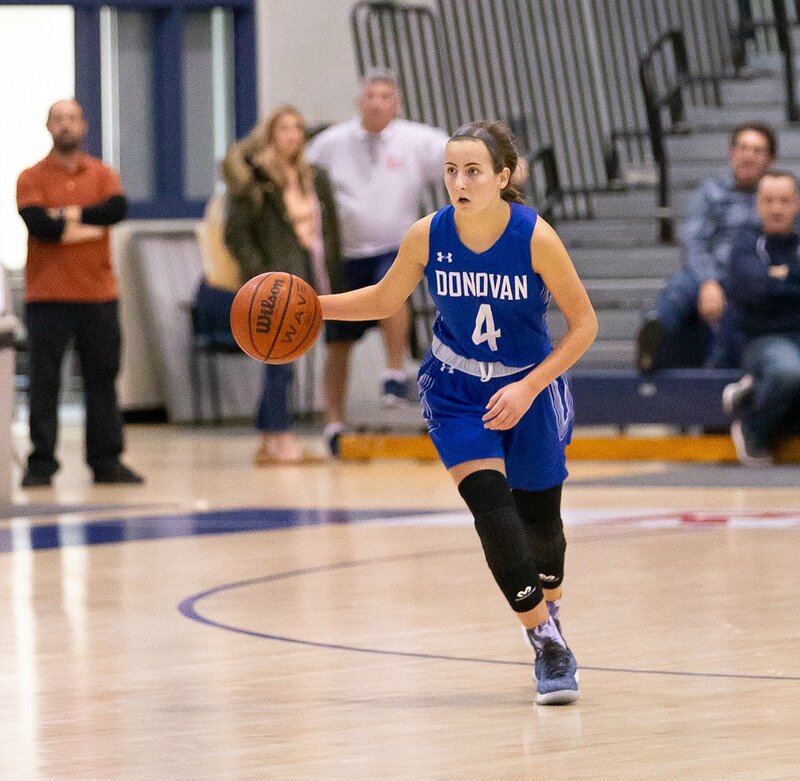 She had 16 points, 5 rebounds, 4 steals and 4 dimes vs. Union Catholic. Then finally against Top 10 Bishop Ahr she had 11 points, 5 rebounds and 6 dimes. Most of this gets lost during the season. Because Donavan Catholic is not a so called powerhouse. But it has not stopped Paige Slaven from showing she is as good as any point guard in the Shore. Paige Slaven does whatever is needed. That more than anything else separates her from just about ever other point guard in the 2020 class. Its early in the AAU season but already Slaven is showing us what to expect. Yesterday against Team Miller she had 19 points. She is the ultimate gym rat in every sense of the word. Her talent speaks for itself. I believe the next step for Slaven is to be a Top 10 player in the Shore Conference. But for now, look for her to have a show stopping spring and summer. Why? Because Paige Slaven is the ultimate competitor and that’s what AAU basketball is all about….